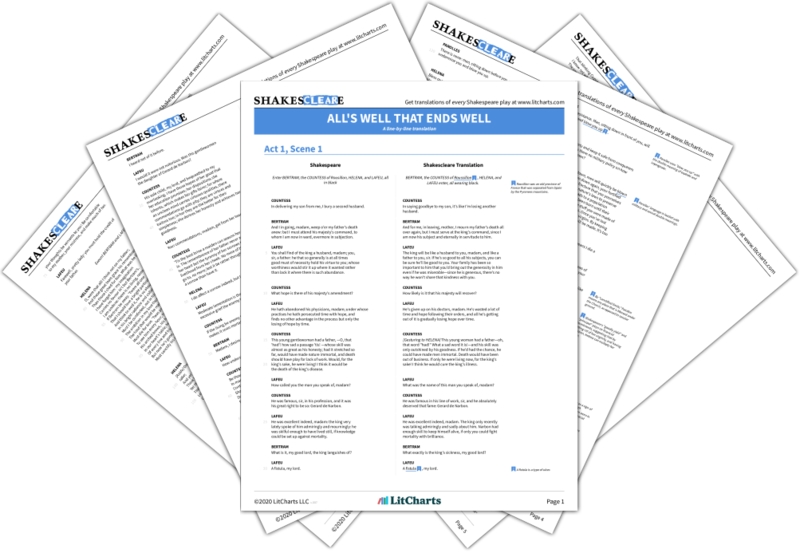 Instant downloads of all 941 LitChart PDFs (including All's Well that Ends Well). New! Understand every line of All's Well that Ends Well. 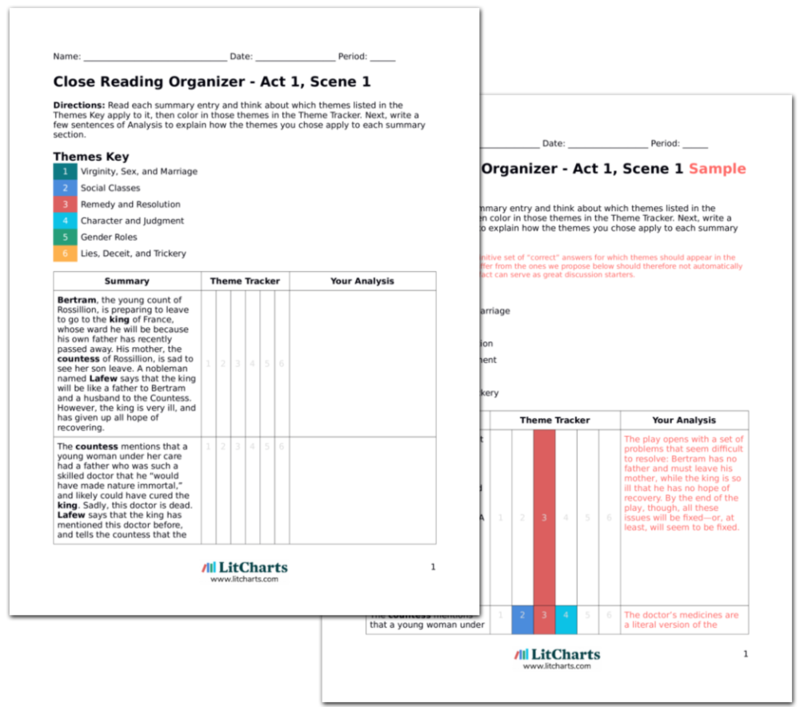 LitCharts assigns a color and icon to each theme in All's Well that Ends Well, which you can use to track the themes throughout the work. At Rossillion, the countess orders the fool to bear a letter to the royal court. The fool speaks contemptuously of the court, and the countess asks him why he seems not to respect it. The fool tells her he has an answer for all questions, and launches into some witty wordplay, annoying the countess. The fool continues to tease the countess with wordplay and jokes, until the countess stops him and gives him a letter to deliver to Helen. She tells him to send her greetings to her son while he is at the royal court, and hurries him away. The fool again uses his clever wit and jokes to get back at his social superiors in a small way, as they constantly order him around. In the end, though, he does carry out the countess’ orders. Fredericksen, Erik. "All's Well that Ends Well Act 2, Scene 2." LitCharts. LitCharts LLC, 19 May 2014. Web. 17 Apr 2019. Fredericksen, Erik. "All's Well that Ends Well Act 2, Scene 2." LitCharts LLC, May 19, 2014. 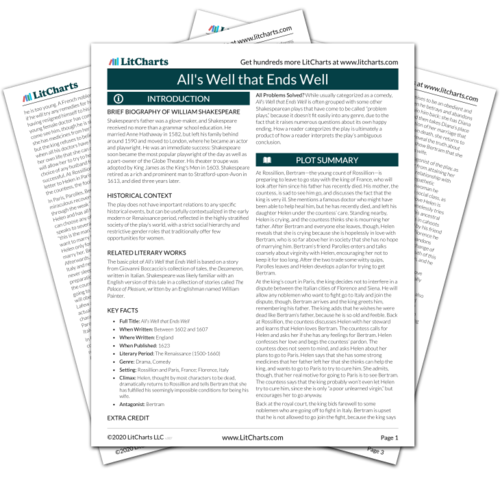 Retrieved April 17, 2019. https://www.litcharts.com/lit/all-s-well-that-ends-well/act-2-scene-2.